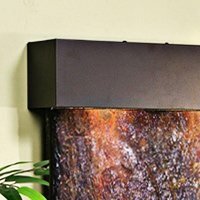 This ethereal wall fountain will cast a warm, relaxing shadow over any room while also being a great work of serene wall art. 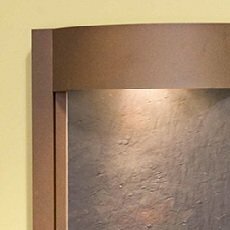 Handmade using beautiful Featherstone or mirror face material with a powder-coated steel frame, the Adagio Serene Waters Wall Fountain is the perfect touch for living rooms, reception areas, libraries or other spaces where you want a soothing glow. 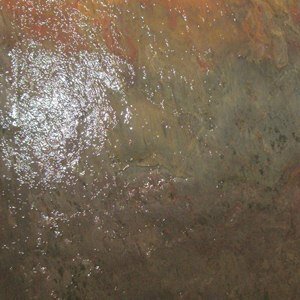 A halogen light makes the water shimmer as it glides down the face to the river rock basin, bringing instant relaxation. 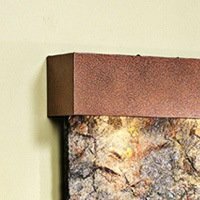 Choose from a number of frames to accent your space and face material, with rustic copper and stainless steel available in addition to the powder-coated steel options. You can also add polished black pebbles to the basin, upgrade to LED lighting, choose your own stone and even get a custom logo engraved. And thanks to the submersible electric pump, no plumbing is needed – just follow the EZ installation guide, plug into an electrical outlet, hit the on/off switch and enjoy this impressive water feature. 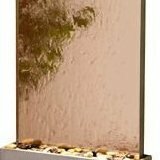 Order today and we’ll securely ship your new indoor fountain absolutely free. Recirculating electric pump is included. 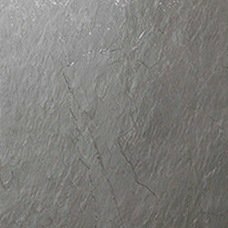 Perfect for indoor applications at home or office. Pebbles and halogen lighting included along with an EZ installation guide. An upgrade to LED lighting is available. 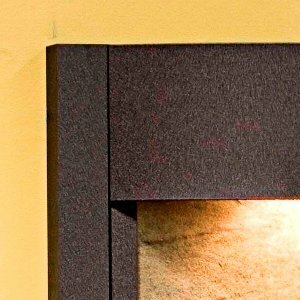 This lighting comes complete with remote control and multi-functional/multi-color lighting capabilities. Manual fill with no plumbing needed to operate. Additional options: stone selection, LED lights w/ remote, black polished pebbles and customized logo. 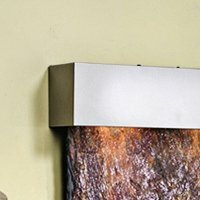 We absolutely LOVE Adagio stainless steel wall fountain. It is everything we hoped and more. Beautiful addition to our relaxation room. Good customer service and timely shipping. Very nice. This fountain completes our home. It's very calming, and beautiful. A piece of art! I absolutely love this fountain! It is mounted in my foyer area and is the focal point of my living room .....Beautiful!!! The led light makes this fountain magical. Indescribably soothing.....a great buy! 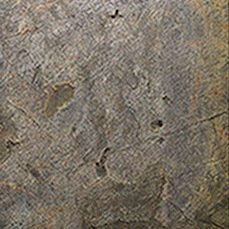 I ordered this fountain in copper vein finish as it perfectly matches to the wall fo my living room. 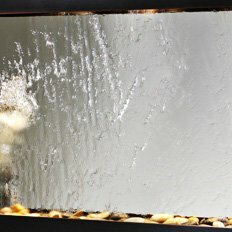 The day I received this Serene Water Wall Fountain I already have planned where to install it. The fountain looks spectacular in my living room and working really great. I hung this fountain on the wall of my living room and I must admit that this this fountain was very easy to install as I have never thought that I would be able to install this fountain alone. A very nice product with such an affordable price.